Per the Atlantic, Wieselthaler said that the use of the pump requires anticoagulants to "make the blood thinner and prevent clots from forming", though that comes with the risk of uncontrolled internal bleeding. 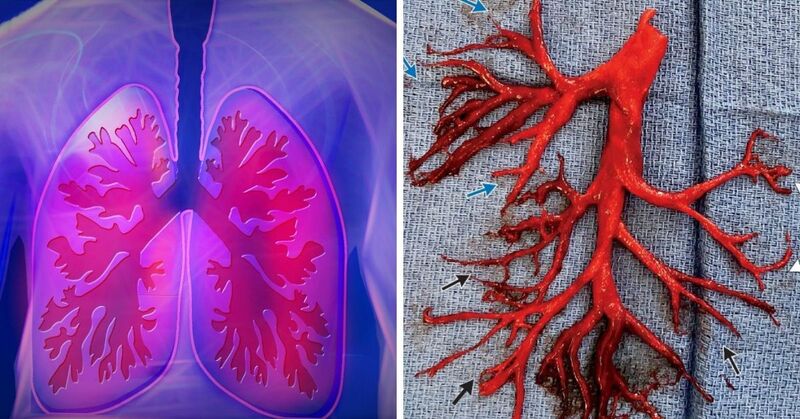 The New England Journal of Medicine (NEJM) posted a picture on Twitter of a coughed up blood clot in the shape of a patient's right lung's bronchial tree. "We were astonished", Dr. Georg Wieselthaler, a heart and lung surgeon at the University of California, San Francisco (UCSF), who treated the patient, told the Atlantic. The right bronchial tree consists of three segmental branches in the lung's upper lobe, two segmental branches in the middle lobe, and five segmental branches in the lower lobe. Wieselthaler told the publication that it was the man's blood medication that made the clot rubbery and able to survive the trip out his airway instead of breaking up, since blood clots are typically hard plugs of blood. These medications are what caused the patient's blood to eventually break out of the network and into the lower right lung-due to the clotting agents not being able to fix cracks in the system.